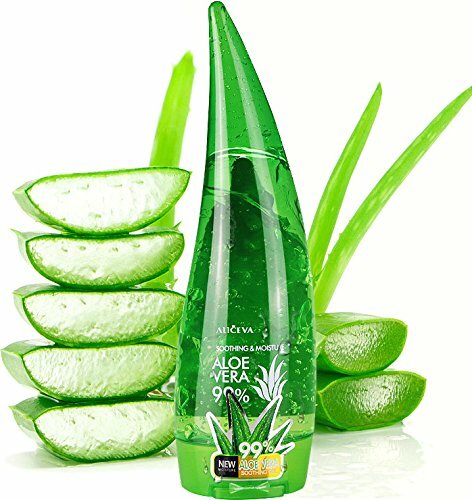 ★Aloe vera contains a huge amount of vitamins including vitamin A, B1, B2, B3, B6, C, and E. It's also rich in choline and folic acid, all of which help the skin stay healthy. Aloe Vera is effective relief for pain and burning. And the unprocessed glycoproteins + polysaccharides repair damaged skin cells, while reducing inflammation. You can understand why ancient Egyptians and Chinese used it as a medicinal must-have. ★ALOE VERA GEL - Aloe Vera Gel has been known to naturally contain vitamins B1, B2, B3, B6, and B12, as well as vitamins A, C and E, which are antioxidants and beneficial for your health. These minerals have anti-inflammatory, healing, soothing and antibacterial properties, and they can assist in proper body function. ★HEALS & SOOTHES SKIN - With anti-inflammatory and cooling properties, Our Aloe Vera gel is the perfect remedy for sunburned skin. It provides a protective layer to the skin which helps retain moisture. Aloe is also rich in antioxidants and minerals which can help speed healing. ★ITCH CALMING - A number of known anti-inflammatory substances have been identified in Our Aloe Vera gel which can help calm inflamed eczema and reduce the incessant itching. It also feels really cool when applied to have an immediate calming effect too. ★SATISFACTION GUARANTEE - All our Aliceva products are backed by our manufacturer 30-day money back guarantee . If you have any questions about this product by Aliceva, contact us by completing and submitting the form below. If you are looking for a specif part number, please include it with your message.